Suddenly we all may feel why Brutal? But yes it is Brutal and swift as a test series could probably get. Let us not get into the history of Ashes; we all are very good at it. But in this article I would make you relive such moments that depicts the culture that Ashes is still keeping and making test cricket survive in this entertaining age of cricket where 6 hitting is the basic culture of Batsmen ship, full speed bouncer is the basic aspect of bowling and sliding to whatever field position you are kept into. Test cricket is all about temperament; mental skills and judgment of batsmen, bowlers bowling the red Kookaburra bowl in the right part of the pitch give it a chance to swing and a fielder waiting for catch in the sleep cordon, but Ashes as I know is all about handling a pressure. For an Australian or English players, it is a dream to be included in the Ashes team. Leaders are born and Talents are harvested to yield a perfect result for either of the teams. Let’s get into the larger picture that I want to show you why Ashes is a culture not just a test series. An oldest rivalry that is turned from classical test matches to the nail bitters and epic test ever played in the history of Test Cricket. It all began with the body line of 1930 when ring of fielders with the classical sledging methodology were deployed to ball a full fierce bouncer to dismiss late Sir Donald Bradman who was in a full flow of his batting career at that time. And the story went on and on with the progress of the series and years to follow after. 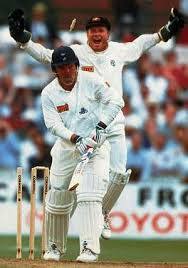 Dennis Lillie and Sir Ian Botham in 1981 epic Ashes classics in which Botham Majestically blasted 149 out of nowhere to save his team that were following on and 7 wickets down. Lillie quoted,” I would have taken his wicket every delivery that I landed across him” after the innings break and later on when Australia were chasing a swift target of 130 runs ever so easily when they were cruising with 56/1 on the board. Later the sledge that Botham counter attacked while batting with his lower order batsmen of having a humpty Dumpty with the Australian team paid off as they had a team meeting in the drinks break and before anyone could even notice what happened it was Bob Willis, a tall classic fast bowler that led England to restrict Australia for 75/8 and far away from victory in a second like a tidal wave and completed with the career best of 8/43 at that time. This continued until 2005 where Ponting pointed his Finger in the English dressing room for keeping substitute fielder Gary pratt as he was unnoticed about the deployed fielder at that position, The Bowden’s call of raising up his finger in the decisive moment of the Edgebaston test match to Stephen harmison’s bouncer that clipped the shoulder clearly shown on the replay that helped mighty Englishmen to win the thrilling Ashes series and It still is a decision that phrases to one of the greatest What If’s of Australian Test Cricket history. Similarly the dismal giant Mitchell Johnson bowled one of deadliest spell of test cricket history in Australian soil to claim back the Ashes and rattled into the skin of the English batsmen eventually leading Jonathan Trott to flew back home with depression while Johnson dedicated that spell to his late team mate for the transformation his accidental death brought into himself. Similarly David warner scored runs at the top of the order while Steve Smith, Captain Clarke batting well for hosts and ben stokes came out like a gem to be the England preciously found counter attack for Johnson and Co. who were blasting bullets with the ball and dynamite with the words and talking on the pitch. So in a broader picture with just a week away from such a traditional rivalry of these two teams, guys like Joe root, Steve Smith, Mitchell Starc, Ryan Harris, James Anderson, Micheal Clarke, Ben stokes, leg spinner Rashid, Nathan Lyon and Joss hazzlewood , the heat is on and the epic series is waiting on the making and as they say #AS BRUTAL AS IT GETS has a meaning for the upcoming contest of bat, ball, field and of course word exchange!!!! The Story of Brutality continues……. Thank u Kshitiz ji for your generous words. It will surely boost me to write more.